As part of creating or editing a conference, you can choose to set up your conference to be recorded. Once this setting is enabled, you can start and stop the recording as necessary in the Conferences interface. After the conference has concluded, you can view recorded segments in the group Conferences page. If you recorded multiple segments in your conference, each segment will be a separate recording. 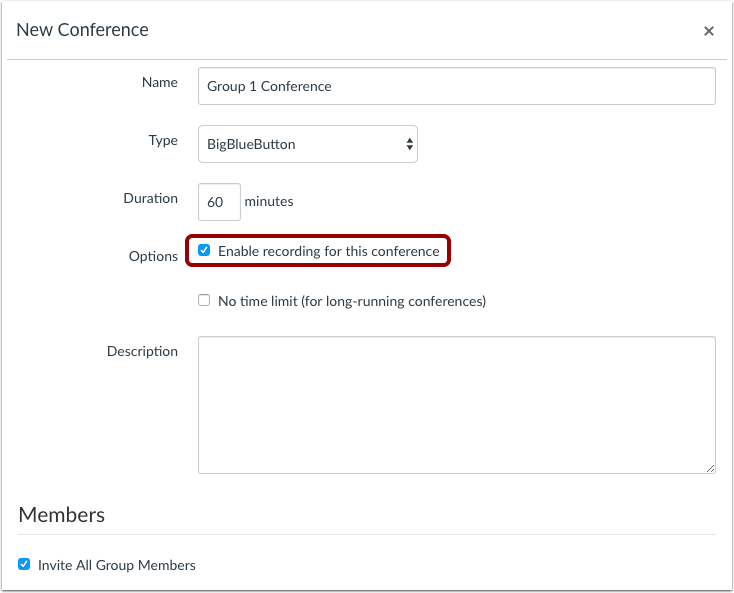 When creating your conference, you must select the record option to record the conference. Canvas' standard recording feature will store your recordings in Conferences for 14 days and then remove them automatically. Recorded conferences cannot be downloaded. Recorded conferences can only be viewed inside the group where the conference was recorded; URLs cannot be shared outside Canvas. While completing the details for the conference, click the Enable recording for this conference checkbox. 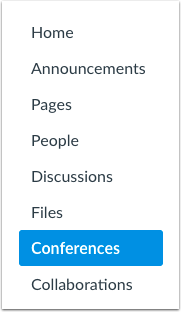 Once you start your conference, you can start and stop the recording as necessary in the Conferences interface. Previous Topic:How do I edit a conference in a student group? Next Topic:How do I start a conference in a student group? Table of Contents > Conferences > How do I record a conference in a student group?